Realtor Viki Kaas, of Homes Unlimited, Inc., spearheads spring and summer shoe donation drive for Soles4Souls to help people in need. Realtor Viki Kaas, of Homes Unlimited, Inc. I strongly encourage everyone in the community to donate a pair of shoes to help a person in need.There is just a really big need for the people that don’t have shoes. Homes Unlimited, Inc. is hosting a donation drive for Soles4Souls, collecting shoes through summer. New or gently worn pairs of shoes can be dropped off at 207 East Northern Lights, Suite 121, Anchorage, AK. Soles4Souls is a nonprofit global social enterprise committed to fighting poverty through the collection and distribution of shoes and clothing. 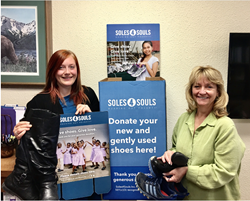 In addition to supporting Soles4Souls, third generation Alaskan, Viki Kaas is a dedicated community advocate. She volunteers to cook for the workers at Kokrine Hills Bible Camp and volunteers at a local private school. She has held various officer positions in the Anchorage PTA and was a Camp Fire Alaska leader for seven years. About Viki Kaas, Homes Unlimited, Inc.
Viki Kaas is a Graduate, Realtor Institute and Certified Residential Specialist. She is currently president-elect for the Anchorage Board of Realtors, a position she also held in 2003. Over the years, she has served as president of the Alaska Multiple Listing Service, and served on the board of the PTA, Alaska Association of Realtors and Community Council, in addition to volunteering for Birchwood Christian School and the Crossings at Birchwood. Homes Unlimited, Inc. is a high-tech virtual brokerage in Anchorage. For more information, please call (907) 346-4111, or visit http://www.callviki.com.